If you are a golfer and you've never visited Myrtle Beach, you're missing something special. But where to play? These are some of the best golf courses in Myrtle Beach South Carolina, chosen from more than 120 public golf courses and luxury resorts in the area. Golf courses in the area are not only challenging, but they are also scenic. Our picks include courses along the amazing stretch of coastline that is the Grand Strand, some 90 miles of South Carolina's "Intracoastal Waterway," one of nature's natural wonders. In this area, you'll encounter wetlands, marshes, sandy beaches with quiet, secluded coves as well as beautiful lakes. Visitors to the Myrtle Beach area rave about the seafood, history, unique shops, scenic cruises, the two oceanside state parks, deep sea and inshore fishing, and, last but not least, the amazing golf courses. The Grande Dunes Resort Golf Course has five sets of tees and plays a whopping 7,618 yards from the tips—5,353 yards from the forward tees— making it the longest course on the Grand Strand. With its spectacular layout, this 18-hole course is set on a high bluff with an amazing view of the Intracoastal Waterway and Grande Dunes Marina. The Man O' War Golf Course, is a uniquely exciting challenge, a fair playing field where course architect, Dan Maples, delved deeply into the dark world of the imagination to create an astonishing layout of intertwining holes that call into play a diversity of skills and provide even the advanced player with a thousand opportunities to think, and then think again. The TPC of Myrtle Beach, located in Murrells Inlet, is not quite the toughie we've come to expect from master designer Tom Fazio, but it's well worth a visit. The 18-hole championship course plays a little shorter than most of its peers, just 6,950 yards off the championship tees with a course rating of 74 and a slope of 145. 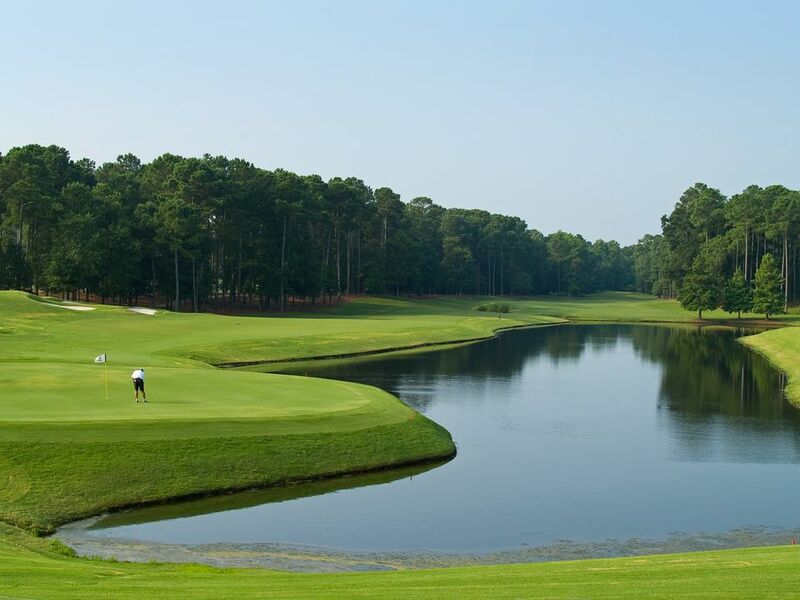 Much more than the average resort course, TPC Myrtle Beach offers an enjoyable day out and a challenging round of golf. The Tidewater Golf Club Course plays a little longer than 7,000 yards but, as you journey from green to tee, there's a definite feeling that you're part of the "Never Ending Story." From the first tee, Tidewater twists, turns and meanders back and forth from one implausible feature to the next. Five sets of tees offer something for just about everyone, of every level of skill, but even some of the forward tees offer vistas that intimidate and make club selection more of a lottery than a choice. The Wachesaw Plantation East Course, With five sets to tees and a professional practice/teaching facility, this traditional Scottish-design course, will provide you with an enjoyable experience, no matter what your level of skill might be. Golf Digest's "Places to Play" gave Wachesaw Plantation East a four-star rating. The closest regional airport is the Myrtle Beach Airport (MYR). The airport is served by Delta, Continental, US Air, SpiritAir, and several other airlines.